Crossing into Columbia from Ecuador wasn’t too hard but the ride from the border to our first stop, Popayan was one of our worst. 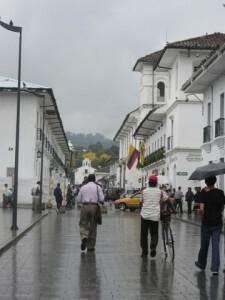 The roads were good up to Posta so we decide to push on to Popayan – bit mistake. The next major town has an ATM so we are cashed up but the hotels are dodgy. 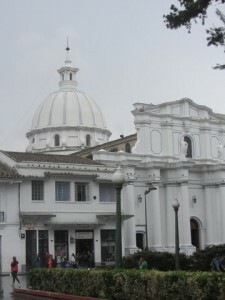 The police and the locals tell us to move on to Popayan – just 85 kilometres away. One did say the road was a little bumpy. A little bumpy ended up being an understatement. It took us three hours through rain, darkness, road works and potholes that could swallow the bike. 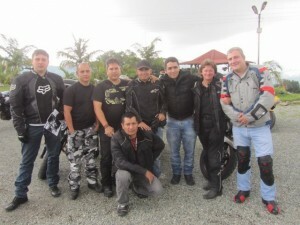 After such a ride Popayan was a dream destination. 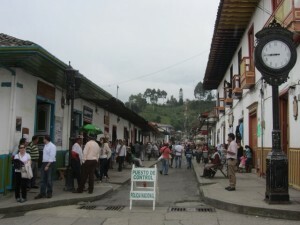 This colonial town has whitewashed buildings, narrow streets and charm. It’s a university town and is filled with young people bustling around. And it has a terrific Mexican bar that makes a very good mojito (with lots of mint, Vince)! It’s the lead up to Easter and the town is getting a spruce up. 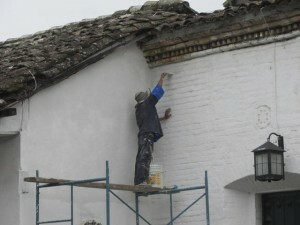 It’s being painted and polished – a hive of activity. We feel very safe – everyone is friendly and welcoming. Our next stop is Cali, but just for the night. We don’t have much time so we are heading to Salento in the hills above Bogota. All along the roads in Columbia there are police and military check points. They give us the thumbs up as we pass. We thought they loved us, but it’s something they do to everyone, to reassure them that they are there to protect not hinder. Salento has the most beautiful square, tiny streets and a cathedral. 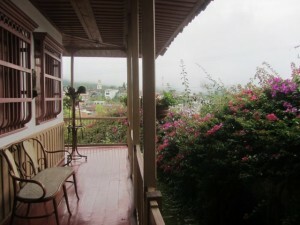 Our guesthouse is set in a tropical garden with a couple of rocking chairs on the veranda. It’s a great place to chill. We have books to read, good wine from the local supermarket – we can’t ask for much more. In the square we meet some local bikers who invite us to a BMW test ride the next day. They couldn’t be friendlier. They offer assistance with any problems, give us email addresses and mobiles, just in case. Next stop Bogota where we will part company with the bike for the first time in five months. Our parting takes a lot longer than we expected. 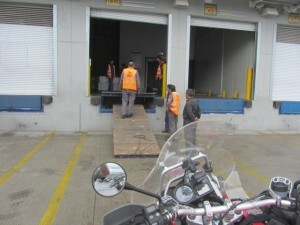 We are at the international freight terminal for a day and a half – more than half of that time waiting for the police to come and inspect the bike. 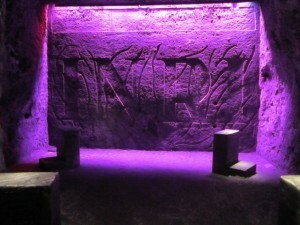 With the bike securely locked away in the freight terminal we head to Bogota’s Salt Cathedral. 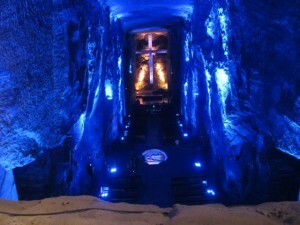 It is one of the wonders of modern engineering – a massive Cathedral carved out in a salt mine not far from the capital. Mood lighting and a very good sound system make this a very impressive Cathedral. The fact it is 200 metres underground makes it even more so. There is enormous pride when the guide tells us that no miners were killed building the cathedral. He doesn’t mention how many have been killed extracting the salt from the mine, which still operates today. A simple flight from Bogota to Panama City almost doesn’t happen when the airline refuses to let us on the plane without an airline ticket out of Panama City. The refundable ticket costs us more than $800 US and nearly cost us Brian’s sanity. Columbia’s tourist slogan is ‘the only risk is you may not want to leave’. Our problem was we nearly couldn’t!